This is the email I sent with collage to my medical alumni group that helped raise seed money for Braveheart II. I am delighted to inform everyone that Operation Braveheart II is back in action. THANK YOU once again for all your donations and efforts to raise funds for our Chapter's project. We are grateful for the kind volunteer efforts of Dr. Jonas del Rosario. He is assisted by his Fellow for this year, Dr. Jethro Macallan, nurses and other volunteers. I have known Jethro since he was a struggling medical student. He is now a Board certified pediatric cardiologist and is doing his fellowship in Interventional cardiology under the tutelage of Jonas. He will hopefully be another volunteer in the future. 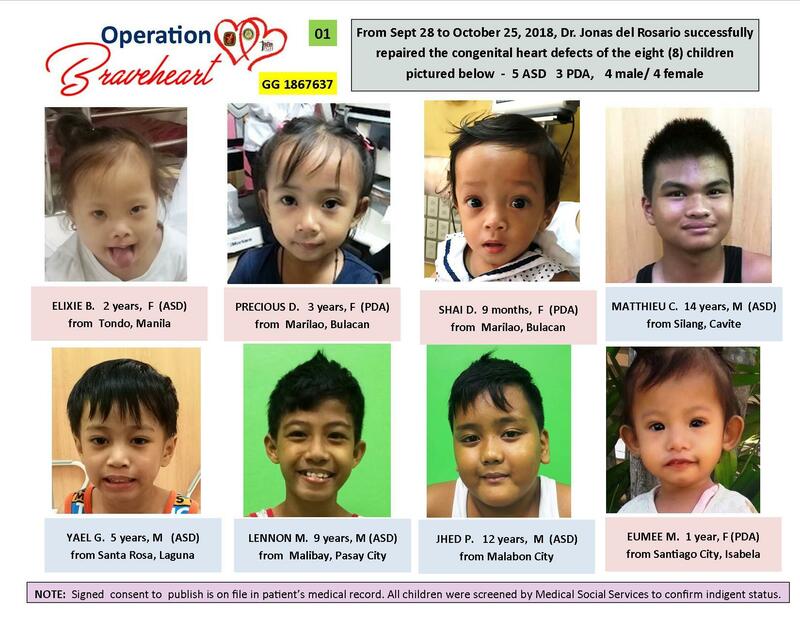 In addition to repairing children's heart defects Operation Braveheart is also providing opportunities for young physicians to become future interventionists in the Philippines. ELIXIE, the first patient operated by Jonas in Sept 28 is a 2 year old girl with Atrial Septal Defect and Trisomy 21. The family is from Tondo, Manila. Her father is a delivery boy/ driver. Her mother is unemployed. You are all part of this. This is your project.